Laurence Sterne (November 24, 1713 – March 18, 1768) was an English novelist and an Anglican clergyman. He is best known for his novels, The Life and Opinions of Tristram Shandy, Gentleman, and A Sentimental Journey Through France and Italy; but he also published sermons, wrote memoirs, and was involved in local politics. Tristam Shandy is infamous for its length, as Shandy is famously and comically known for his inability to tell his story, with endless digressions. It owes a debt to the bawdy, bodily humor of François Rabelais as well as the comic absurdity of Miguel de Cervantes. Written in the age of John Locke's empiricism, the novel contains a kind of comic meditation on Locke's ideas. Sterne died in London after years of fighting tuberculosis. 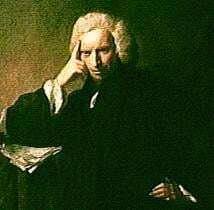 Laurence Sterne was born November 24, 1713, in Clonmel, County Tipperary, Ireland. His father was an Ensign in a British regiment recently returned from Dunkirk, France. Sterne’s father’s regiment was disbanded on the day of Sterne’s birth, and within six months the family had returned to Yorkshire in northern England. The first decade of Sterne’s life was spent moving from place to place as his father was reassigned throughout England and Ireland. During this period, Sterne never lived in one place for more than a year. Sterne was sent to Hipperholme Grammar School near Halifax, West Yorkshire, when he was ten years old; he never saw his father again. Sterne was admitted to a sizarship at Jesus College, Cambridge, in July 1733, at the age of 20. His great-Grandfather, who was made Archbishop of York in 1664, had been the Master of Jesus College, twice, earlier in the seventeenth century. Sterne graduated with a degree of Bachelor of Arts in January 1737; and returned in the summer of 1740, to be awarded his Master of Arts degree. Sterne seems to have been destined to become a clergyman, and was ordained as a deacon in March of 1737, and as a priest in August 1738. Shortly thereafter, Sterne was awarded the living at Sutton-on-the-Forest in Yorkshire. Sterne married Elizabeth Lumley in 1741. Both were ill with tuberculosis. In 1743, he was presented to the neighboring living of Stillington, and did duty both there and at Sutton. He was also a prebendary of York Minster. Sterne’s life at this time was closely tied with his uncle, Dr. Jacques Sterne, the Archdeacon of Cleveland, England, and Precentor of York Minster. Sterne’s uncle was also an ardent British Whig Party supporter, and urged Sterne to begin a career of political journalism which resulted in some scandal for Sterne and, eventually, a terminal falling-out between the two men. Sterne lived in Sutton for twenty years, during which time he kept up an intimacy, which had begun at Cambridge, with John Hall-Stevenson, a witty and accomplished bon vivant, owner of Skelton Hall in the Cleveland district of Yorkshire. Without Stevenson, Sterne may have been a more decorous parish priest, but might never have written Tristram Shandy. It was while living in the country-side, having failed in his attempts to supplement his income as a farmer and struggling with tuberculosis, that Sterne began work on his most famous novel, The Life and Opinions of Tristram Shandy, Gentleman, the first volumes of which were published in 1759. Sterne was at work on his celebrated comic novel during the year that his mother died, his wife was seriously ill, and he was ill himself with TB. The publication of Tristram Shandy made Sterne famous in London and on the continent. He was delighted by the attention, and spent part of each year in London, being feted as new volumes appeared. Indeed, Baron Fauconberg rewarded Sterne by appointing him as the perpetual curate of Coxwold, North Yorkshire. Sterne continued to struggle with his illness, and departed England for France in 1762, in an effort to find a climate that would alleviate his suffering. Sterne was lucky to attach himself to a diplomatic party bound for Turin, as England and France were still adversaries in the Seven Years' War. Sterne was gratified by his reception in France, where reports of the genius of Tristram Shandy had made him a celebrity. Aspects of this trip to France were incorporated into Sterne’s second novel, A Sentimental Journey Through France and Italy, which was published at the beginning of 1768. The novel was written during a period in which Sterne was increasingly ill and weak. Less than a month after Sentimental Journey was published, early in 1768, Laurence Sterne's strength failed him, and he died in his lodgings at 41 Old Bond Street on March 18, at the age of 54. He was buried in the churchyard of St. George's, Hanover Square. In a curiously "Shandean" twist in events, it appears that Sterne's body was stolen shortly after it was interred and sold to anatomists. It was recognized by somebody who knew him and discreetly reinterred. When the churchyard of St. George's was redeveloped in the 1960s, his skull was disinterred (in a manner befitting somebody who chose for himself the nickname of "Yorick"), partly identified by the fact that it was the only skull of the five in Sterne's grave that bore evidence of having been anatomized, and transferred to Coxwold Churchyard in 1969. The story of the re-interment of Sterne's skull in Coxwold is alluded to in Malcolm Bradbury's novel To The Hermitage. Sterne's early writing life was unremarkable. He wrote letters, had two ordinary sermons published (in 1747 and 1750), and tried his hand at satire. He was involved in, and wrote about, local politics in 1742. His major publication prior to Tristram Shandy was the satire, A Political Romance (1759), aimed at conflicts of interest within York Minster. A posthumously published piece on the art of preaching, A Fragment in the Manner of Rabelais, appears to have been written in 1759. Sterne did not begin work on Tristram Shandy until he was 46 years old. Sterne is best known for his novel, The Life and Opinions of Tristram Shandy, Gentleman, for which he became famous not only in England, but throughout Europe. Translations of the work began to appear in all the major European languages almost upon its publication, and Sterne influenced European writers as diverse as Diderot and the German Romanticists. Indeed, the novel, in which Sterne manipulates narrative time and voice, parodies accepted narrative form, and includes a healthy dose of "bawdy" humor, was largely dismissed in England as being too corrupt. Samuel Johnson's verdict, in 1776, was that "Nothing odd will do long. Tristram Shandy will not last." This is strikingly different from the views of European critics of the day, who praised Sterne and Tristram Shandy as innovative and superior. Voltaire called it "clearly superior to François Rabelais," and later Johann Wolfgang von Goethe praised Sterne as "the most beautiful spirit that ever lived." Both during his life and for a long time after, efforts were made by many to reclaim Sterne as anarch-sentimentalist; parts of Tristram Shandy, such as the tale of Le Fever, were excerpted and published separately to wide acclaim from the moralists of the day. The success of the novel and its serialized nature also allowed many imitators to publish pamphlets concerning the Shandean characters and other Shandean-related material even while the novel was yet unfinished. The novel itself is difficult to describe. The story starts with the narration, by Tristram, of his own conception. It proceeds by fits and starts, but mostly by what Sterne calls "progressive digressions" so that we do not reach Tristram's birth before the third volume. The novel is rich in characters and humor, and the influences of Rabelais and Miguel de Cervantes are present throughout. The novel ends after 9 volumes, published over a decade, but without anything that might be considered a traditional conclusion. Sterne inserts sermons, essays and legal documents into the pages of his novel; and he explores the limits of typography and print design by including marbled pages and, most famously, an entirely black page within the narrative. Many of the innovations that Sterne introduced, adaptations in form that should be understood as an exploration of what constitutes the novel, were highly influential to Modernist writers like James Joyce and Virginia Woolf, and more contemporary writers such as Thomas Pynchon and David Foster Wallace. Italo Calvino referred to Tristram Shandy as the "undoubted progenitor of all avant-garde novels of our century." The Russian Formalist writer Viktor Shklovsky regarded Tristram Shandy as the archetypal, quintessential novel, of which all other novels are mere subsets: "Tristram Shandy is the most typical novel of world literature." However, the leading critical opinions of Tristram Shandy tend to be markedly polarized in their evaluations of its significance. Since the 1950s, following the lead of D.W. Jefferson, some prominent critics argue that, whatever its legacy of influence may be, Tristram Shandy in its original context actually represents a resurgence of a much older, Renaissance tradition of "Learned Wit"—owing a debt to such influences as the Scriblerian approach. Two volumes of Sterne's Sermons were published during his lifetime, and, despite the fact that more copies of his Sermons were sold in his lifetime than copies of Tristram Shandy, and for a while he was better known in some circles as a preacher than as a novelist, they are conventional in both style and substance. Several volumes of letters were published after his death, as was Journal to Eliza, a more sentimental than humorous love letter to a woman Sterne was courting during the final years of his life. Compared to many eighteenth century authors, Sterne's body of work is quite small. His works, first collected in 1779. were edited, with newly discovered letters, by J.P. Browne (London, 1873). A less complete edition was edited by George Saintsbury (London, 1894). The Florida Edition of Sterne's works is currently the leading scholarly edition—although the final volume (Sterne's letters) has yet to be published. Benjamin, Lewis S. Life and Letters. Appleton, 1912. Stapfer, Paul. Laurence Sterne, sa personne et ses ouvrages. Paris: 1882. Texte. Rousseau et le cosmopolitisme littôraire au XVIIIème siècle. Paris: 1895. Thayer, H.W. Laurence Sterne in Germany. New York: 1905. Ron Schuler's Parlour Tricks: The Scrapbook Mind of Laurence Sterne. Asterisk*: a site inspired by Sterne dedicated to the study of innovative narrative. The Tristram Shandy Web - Annotated edition of "Tristram Shandy," in hypertext format. This page was last modified on 21 June 2018, at 21:14.